To me, there is no question that Akira is a better movie than Tim Burton's Batman. But there was a big spike in voting over the weekend — the weekend Batman v. Superman: Dawn of Justice opened nationwide — and the DC/International poll received over twice as many total votes as the Marvel/Indie poll. I think our readers were looking back at an earlier time, and fondly. A time when nobody believed superhero movies could work. A time when no one thought the four-color, pulpy adventures of people in capes and tall boots could be taken seriously or told in a serious way. A time when somebody with a clear, outsider vision could prove to the world it was ok to like comic books and believe in heroes. Probably more than anything else, Tim Burton's Batman paved the way for the cinematic universe we all currently inhabit. And so for that reason, maybe it does belong in the final. 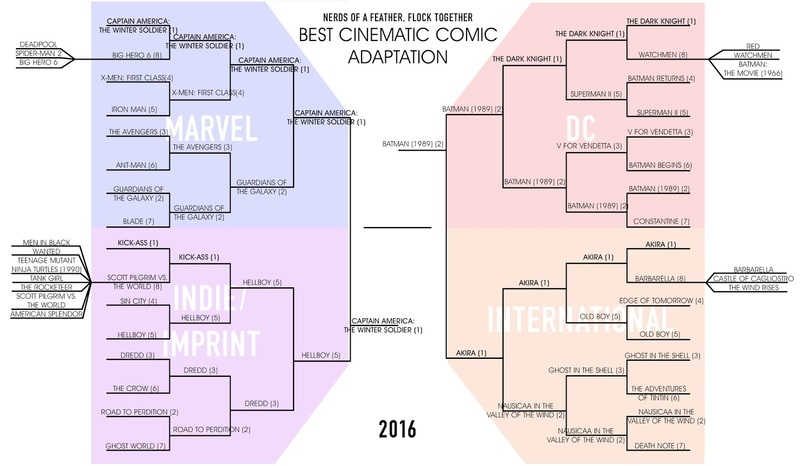 And look, it was probably always going to end in Marvel vs. DC, anyway. So have at it, kids. Best Comic Book Movie. Evar. Previous rounds here, here, here, here, and here.